Regular readers will already know that my Titanium Orange Brompton is gradually becoming the Brompton I use for all other uses apart from my daily commute to and from work. I have been tinkering with my beloved Titanium one for a few weeks now and my attention turned to the saddle bag. It was not that long ago when for example cycling from London to Oxford (in fact coming up to a year ago) I actually took my front C-bag! I shudder to think what I had packed away in it however I do recall it being full to near bursting with everything but the kitchen sink! I remember thinking at the time that although heavy I'd almost certainly need everything packed therein, just in case. How times have changed! The amount of kit I take out on a longer ride has gradually got lighter and there has been a ruthlessness about whether an item is actually needed in the first place. My saddle bag has over time got lighter and lighter but wanting even better performance I decided to embrace minimalism further still. 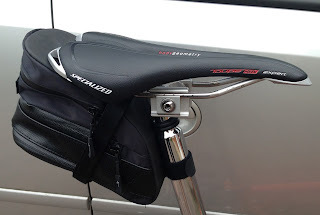 Perhaps I have been reading too many cycling magazines aimed squarely at roadies but I have decided to dip my toe further into some of the kit for the road bike user. 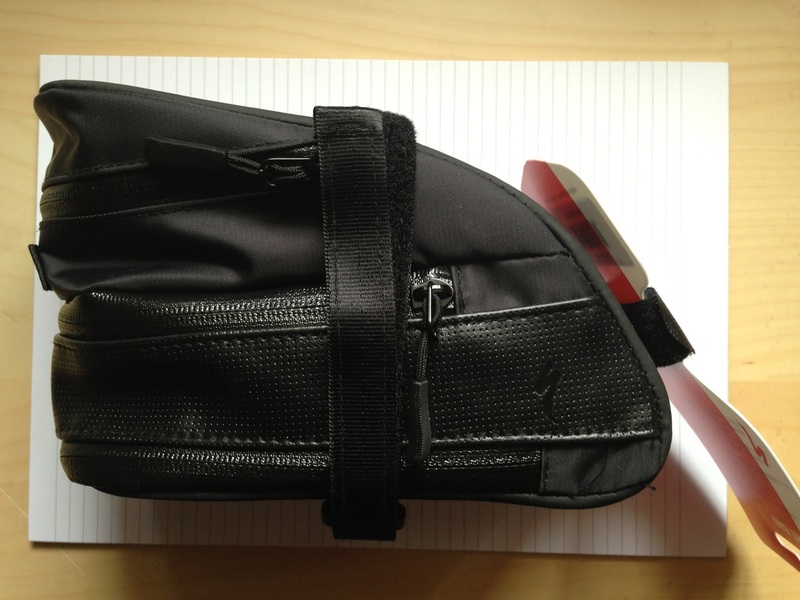 The bag is very lightweight and has a number of advantages over my Carradice Zipped Roll Bag. First as I have perhaps given away it is a great deal lighter. I have not got weights but I would say it is about half its weight. In addition to this, this bag does not sit horizontally to the seat and therefore doesn't have bits sticking out making it more aerodynamic. The top compartment has a neoprene pocket which is said to be a tool pocket. I would beg to differ saying that it would make an excellent place to store a mobile phone, wallet or money. The bag attaches to the rails via two strong velcro straps. A further strap goes around the seat post. It is a simple idea but works well. The bag is held firmly in place, doesn't move around and despite the slight overhang seen in the pictures does not makes its presence felt at all. When I first fitted it I was worried that I would be sitting on the top of the bag but a lengthy test run confirmed that I would not. Another nice touch is that the Specilaized logo on the back of the bag is in fact a loop from which one can attach a rear light. I have to say that I am rather impressed with it and even will all of the above inside it felt a great deal lighter than my Carradice Roll Bag. 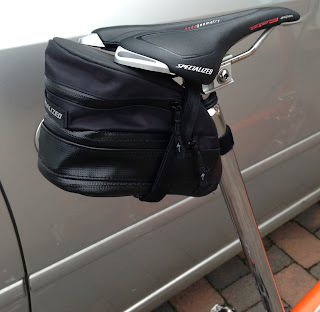 I still really like the Roll Bag and would not part with it but this new 'Dirt Bag' is certainly going to be the saddle bag I take with me for the majority of future rides on my Titanium Orange Brompton. This new addition is a further move towards making my Titanium Orange Brompton the best bike I can for all the adventures I have coming up. There will be more changes on the way - some that you might be very surprised by - so keep reading! As always please leave a comment in response to this or any of my other blog entries. I like to think that us cyclists are all on the same team, regardless of what bicycles we ride and like best and your comments are often useful for other readers as well as yours truly. Just dropping a line to say that I get a lot of enjoyment from your posts,and I particularly like the pics you post showing everything in detail and how things look. I have two Bromptons myself a M type and a S type and I love them both but I would like to know how to "look after them" better. Thanks again for a informative and enjoyable blog..
Hello Tracey and thanks for your kind words. How to look after your Brompton...I feel a blog post coming in the near future just for you. Currently saving for my first Brompton, with a view to do some touring. Appreciate the detail you provide regarding how you have your bikes set up.